ATF6 antibody LS-C136870 is an unconjugated rabbit polyclonal antibody to human ATF6. 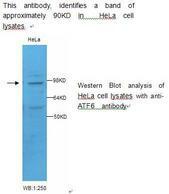 Validated for ELISA and WB. ATF6 antibody detects endogenous levels of ATF6 protein. Not tested with other proteins.